Find all of your laboratory and workplace supplies at Safety Emporium! Myalgia is muscle pain. The term is derived from the Greek words "myos" (muscle) and "algos" (pain). Myalgia can occur in an isolated muscle or in multiple muscles across the body. The condition can be acute (short-term) or chronic (long-term). There are a number of possible causes (see below). Myalgic is the adjective form of myalgia. Get your first aid, CPR, choking, and other safety wall posters at Safety Emporium. Autoimmune disorders (e.g. Polymyositis, dermatomyositis, lupus, etc). Electrolyte imbalances (e.g. too much potassium or too little calcium). See also diuretic. Drugs (e.g. amphotericin B, carbinoxolone, chloroquine, clofibrate, corticosteroids, hydroxychloroquine, cocaine, statins for lowering cholesterol, ACE inhibitors for lowering blood pressure, etc.). Muscle weakness or paralysis of any muscle. Fibromyalgia is a little-understood condition involving chronic widespread pain and a heightened and painful response to gentle touch. There is still considerable debate whether it is a "real" disorder, so any specific cause or causes are still unclear. We have never seen this term used on an MSDS, but see Further Reading below for more information. 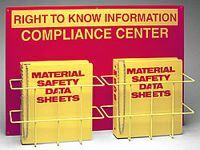 Compliance with OSHA regulations doesn't have to be a pain in the neck. Get your RTK centers and more from Safety Emporium. Myalgia and associated conditions may be caused by exposure to certain chemicals. For example, ingestion of L-tryptophan (5-HTP), which can be found in some foods and dietary supplements, is thought to cause Eosinophilia Myalgia Syndrome (see Further Reading below). Always read your MSDS before working with a new chemical so you will be aware of any possible symptoms of exposure. Muscle Aches at the NIH's MedLine Plus. Definition of Myalgia at MedicineNet.com. Eosinophilia-Myalgia Syndrome and L-Tryptophan-Containing Products, a report in the US CDC's Weekly Morbidity and Mortality Report. Additional definitions from Google and OneLook. Entry last updated: Monday, August 22, 2016. This page is copyright 2000-2019 by ILPI. Unauthorized duplication or posting on other web sites is expressly prohibited. Send suggestions, comments, and new entry desires (include the URL if applicable) to us by email. Disclaimer: The information contained herein is believed to be true and accurate, however ILPI makes no guarantees concerning the veracity of any statement. Use of any information on this page is at the reader's own risk. ILPI strongly encourages the reader to consult the appropriate local, state and federal agencies concerning the matters discussed herein.